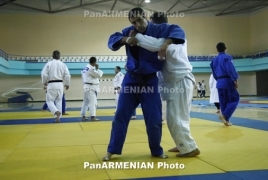 PanARMENIAN.Net - Armenia's judo team will not leave for Baku to participate in the World Championship set to be held in the Azerbaijani capital on September 20-27. The reason behind such a decision is Azerbaijan’s failure to provide security guarantees for of the Armenian athletes. As reported earlier, Arsenal midfielder Henrikh Mkhitaryan may not travel to Baku on October 4 for a Uefa Europa League group stage tie against Azerbaijani champions Qarabag over the Nagorno Karabakh conflict. New Gunners boss Unai Emery has expressed hope, however, that the Armenian midfielder will be able to travel to Azerbaijan.